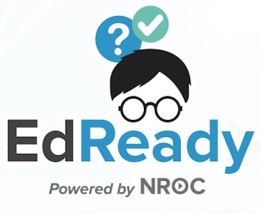 The NROC College Readiness System, called EdReady, is a cloud-based application that personalizes the pathways to college readiness via referral to appropriate digital resources. By default, users are directed to resource components of the NROC Developmental Math program or NROC Developmental English program. Operating System: Microsoft® Windows® 8.1 or higher (for Windows users) or Mac OS X v10.11 or higher (for Mac users). iOS devices (e.g., iPads) are supported as well. Browser: Internet Explorer 11.0 or Edge, Mozilla Firefox 50.0 or later, Google Chrome, Safari 9.0 or later. Internet Connection: A high-speed Internet connection such as DSL or Cable Modem is highly recommended. We do not support the use of Internet Explorer 11 (IE 11) with Windows 10. There are a number of known bugs with IE11/Win10 which especially affect the questions shown in CollegeReady. Please use the default Windows 10 browser, Edge. Have the ability to receive messages from the actcollegeready.org domain, or they will be unable to activate their account or receive password reset notifications.